For anyone that missed Saturday's exciting events, here is the quick and dirty summary. Zillions of pilots flew at Makapuu from morning til evening, including some of our hang gliding pals and two paramotor pilots. Most pilots were feeling too meek for the strong conditions downrange, with a handful of notable exceptions. Doug and Dave flew all day long, and capped off the day with a flight to Stairway to Heaven and a race back. 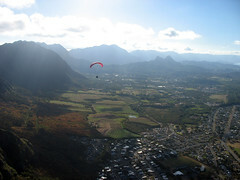 Quentin flew from Makapuu to Greenwalls and from there thermalled the flatlands to soar Lanikai, before landing at the LZ there and walking to his house. Other pilots made forays back into Waimanalo at various times as well: Peter (with Hillery), Alan, Don, Nick, and others. Throughout the day, we saw lots of interesting landings at (or nearly at) the LZ in the challenging north conditions (including mine). Scrappy closed out the day with a fabulous joint birthday party at his parents' house for himself and for Don. I'm sure I missed some exciting details - feel free to post an article of your own or add a comment to this one. As Alex says I will be posting an account of my adventure within a few days or so. I am currently still working on trying to get my gear out. YAY! YAY! HOORAY! Jetflap is BACK! !